Ian Desmond celebrates a score. Credit: Joe Camporeale, USA TODAY Sports. Simply, Colorado is playing like the team many hoped they’d see all season long, coming back for a second straight night to beat the Arizona Diamondbacks 6-5 Saturday in Phoenix. After falling behind 3-0 early, Colorado eventually tied the game at 4-4, then tied it at 5-5 and took the lead in the eighth inning at the winning 6-5 margin. 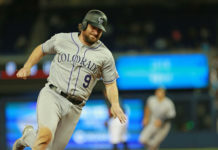 Even though the Rockies scored in four straight innings, all was quiet in Arizona to begin the second game of the series as each team went scoreless through the first three innings of play. Then, in the bottom of the fourth, Kyle Freeland hit one batter and walked two more to load the bases. That turned into a three-run inning for the home Diamondbacks when Steven Souza singled, Nick Ahmed hit a sacrifice fly and Chris Owings singled for the 3-0 lead. 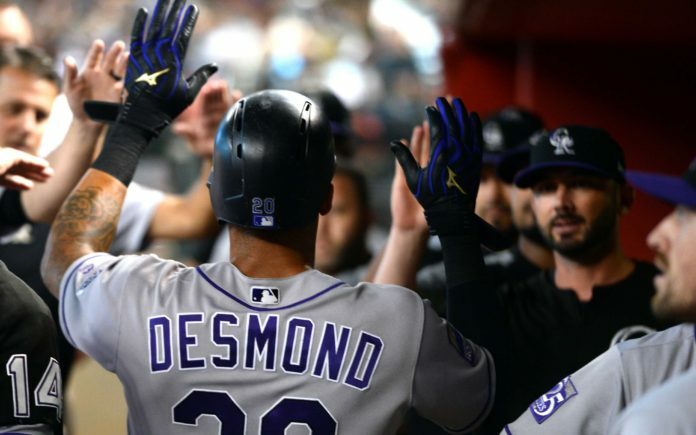 Colorado came to life in the fifth inning, as Ian Desmond knocked a triple and newly called up Garret Hampson doubled to score “Dezzy.” Then, with two outs, Charlie Blackmon entered the box and smashed a ground-rule double to score Hampson and bring the Rockies to within one run, at 3-2. In the bottom half of the fifth, Arizona kept it rolling by loading the bases and Ketel Marte scored when Souza singled. That pushed the D-Backs back up 4-2. That fifth inning was the end of Freeland’s night, he went 5.0 IP giving up five hits and four earned runs with three strikeouts and three walks. 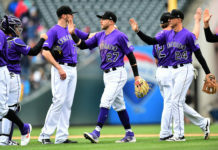 But the Rockies kept it going themselves; in the sixth, Carlos Gonzalez reached on an error, Trevor Story singled, then Desmond singled to score CarGo and bring the Rockies to within one run again. Desmond then stole second base and Hampson was walked to load the bases. Colorado tied the game at 4-4 when Silvino Bracho threw a wild pitch. In the seventh inning, the Rockies took their first lead of the night when Gerardo Parra took off on a pitch from first base and Carlos Gonzalez’s blooper dove to the ground and under A.J. Pollock’s glove, allowing Parra to score from first and give his team the 5-4 lead. Arizona didn’t let the Rockies’ lead last long; Ahmed singled on a blooper of his own to score A.J. Pollock. And Arizona would’ve taken the lead if it weren’t for Scott Oberg’s sliding play on a hard hit ball up the middle that knocked off his glove, in which the bullpen pitcher fired to first base for the third out of the inning. That left it tied 5-5 after seven innings. But, once again, for a fourth straight inning, the Rockies scored when Tom Murphy lifted a bomb out of the park for the 6-5 lead in the eighth inning. Colorado just wasn’t going to leave the park without a win on Saturday night. Wade Davis came in in the ninth inning, allowing Marte to reach and then struck out one and forced another batter into a ground out. And in the end, Davis struck out the final batter looking to give Colorado the win. For the Rockies, it meant a seventh straight victory dating back to before the All-Star break. Colorado is now a mere one game behind the NL West leading Los Angeles Dodgers. Colorado improved to 53-45, eight games over .500 for the first time all season. And, Colorado won the series with the win on Saturday night, which is huge considering the D-Backs have been ahead of the Rockies for months. Next up, the Rockies look for a series sweep of Arizona Sunday afternoon with the first pitch scheduled for 2 p.m. MST. Garrett Hampson, in his first game with the Rockies after being called up from Triple-A Albuquerque, enjoyed a night. He went 1-3 on the night, hitting an RBI and scoring a run while also walking once. And in the eighth inning, he saved a hit by diving to his left and robbing a D-Backs player.